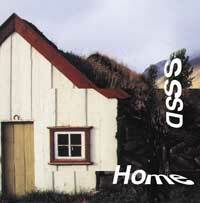 If one reads the titles of the pieces one after the other, it reads "Home Is Where My Hard Disc Was." That is not only a paraphrase of an especially tactless saying. It also expresses the impossibility of an experience, but also the approach toward it. The question is not, what is home, but rather, how much is what we call home something constructed, something created by us-and then how advantageous is the emancipation if we would accept this? The music is that of a guitar quartet (more exact: three guitars and an electric bass); one can associate richly on this-the second track reminded the GROB team of "Shine On (You Crazy Diamond)." All such memories will, however, be disappointed, because the musicians do not confirm them, but rather go their own way without compromising. Thus, this music, so peaceful and seemingly familiar on the foreground, sounds different, always changing-and thereby only consistently fulfills its own premises. The reflection on this difference allows the listeners to acquire a taste for this music (again). The names of the musicians, Martin Siewert, Burkhard Stangl, Taku Sugimoto and Werner Dafeldecker, speak for themselves. In the last five years they have fundamentally influenced the (post) improv scene. The way they deal with silence, the emphatic avowal to precision-precision in the articulation of sounds as in the processing of music in the studio-the intimate knowledge of new music, the farewell to the "wild," "ecstatic" improv attitudes, without letting the music sound aseptic and unfeeling: these characteristics are what the participants have achieved. Their meeting, which was two years ago (they took their time with the post-production), is a stroke of luck. But even more: they present here their meeting not in a documentary way, but rather as if they had played together for years. If that were true, they would represent a group that has existed forever, but only comes together to play after long periods of time. And then they concentrate so much on their common sound, that every (of course, improvised) sounded as if it were played for eternity.